Earlier this month, I spent time down at the Astronaut Scholarship Foundation's annual gathering at the Kennedy Space Center. On my way down, I stopped off in Sarasota at the office of the Paper Money Guaranty folks to show them the flown Jefferson bills. They've got some fatastic offices and people down there. We spent some time chatting about flown currency, and I left them with a lot of resource material, provenance paperwork, etc. (Copies, of course....) And they were kind enough to certify and slab the bills in their PMG holders. I got the idea from going to the World's Fair of Money exposition in Chicago this past year, seeing all the wonderful exhibits of historic paper money....all of which was usually PMG slabbed, cataloged, and certified. 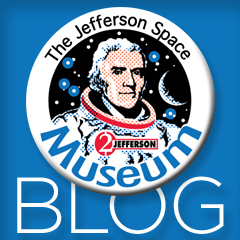 It was a great experience, and another attempt by the Jefferson Space Museum to educate those in the paper money world about these unique bills. Afterward, I took the bills back to the ASF show, and here is a picture of Gene Cernan with the JSM bill of his that flew on all three of his missions, including landing on the moon during Apollo 17. It was a nice opportunity to reunite Gene with the bill, and we had a great time chatting about it once again.